Males have dominated motorsports for a very long time, making it incredibly difficult for any woman to reach the pinnacle of motor racing. Females face far tougher challenges than their male counterparts and have to struggle to try to convince team bosses, fans and officials that they were just as good as anyone else taking part. Fortunately, it now seems as though the trend is shifting to give more opportunities to women who want to forge a career in motorsport. More than ever before, they are being treated as equal to male drivers and are able to make their way up the ladder into top teams and compete at the highest level. This also means that some of the best drivers in the world are now also beautiful women who can dazzle fan both in and out of the car. Portuuguese born Madalena Antas has forged out a successful career in a variety of different motorsport series. Though she has largely been confined to racing in Portugal, she has caught the attention of international fans for her superb rallying skills and unbelievable looks. Antas has also been able to earn money from modelling and enjoys painting in her spare time. Susie Wolff, previously known as Susie Stoddard before her marriage to Mercedes Formula 1 executive director Toto Wolff, is a Scottish born racer who has had a long career in motorsports. She became the first woman to take part in a Formula 1 weekend for 22 years in 2014 when she drove during a practice session and she currently works as test driver for the Williams Formula One team. The 32-year-old has also raced successfully in DTM and British Formula Renault. Milka Duno has raced in the ARCA Racing series, IndyCar, the World Series by Nissan and even the 24 Hours of Le Mans. 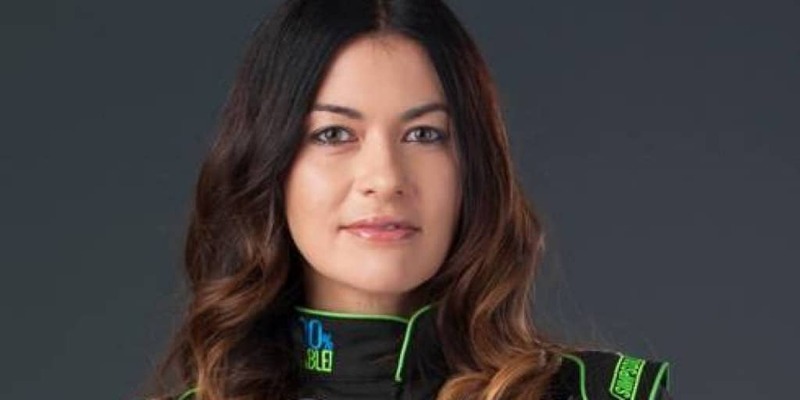 The 43-year-old Venezuelan currently races in the NASCAR Nationwide series but gained notoriety in the motorsport world by being a former model and not starting her racing career until she was 24. Before that she had worked as a naval engineer and achieved a master’s degree in Naval Architecture, Maritime Business, Marine Biology and Organizational Development. The sister of another prominent drag racer, Courtney Force has become one of the best known drag racers in the United States thanks to her numerous wins in the National Hot Rod Association, beating the female victories record set by her sister Ashley Force Hood. She is currently racing for her father’s team John Force Racing and has won a number of awards, including the Auto Club of Southern California Road to the Future Award as Rookie of the Year. Switzerland has produced a number of great racing drivers and one of the most famous of recent years is Cyndie Allemann. The Swiss driver won the Junior Kart Championship in her home country and competed in a variety of different racing competitions such as Formula Renault 2, Formula 3 Euro Series, GT1 World Championship and the Super GT series. She has also taken part the endurance race Le Mans on a number of occasions. Although she graduated from the University of California with a degree in Biology, Leilani Munter chose to follow her dream of becoming a racing driver rather than a career in education or research. Beginning her career in the Allison Legacy Series in 2001, she went on to race in a number of NASCAR series before moving to IndyCar in the Firestone Indy Lights championship. Munter now races for Venturini Motorsports in the ARCA Racing series. Angela Cope made history in NASCAR when she, along with her sister Amber, became the first set of twins to compete in one of the three main series. The 32-year-old began racing in karting when she was just nine and has since competed in the Camping World Truck series and the NASCAR Xfinity series. Her highest finish was in the NASCAR Nationwide Series in 2011 when she completed the championship in 55th place. This 33-year-old Canadian began racing when she was just four years old and has carried on doing so throughout her life. She has raced in a number of different series, including the NASCAR Xfinity series, NASCAR Canadian Tire series, Formula BMW and the Skip Barber Racing series. To help raise funds so she could continue to compete in motor racing, Dufault has modelled to a very high level, winning numerous awards, and even worked as a stunt driver in Hollywood films. 26-year-old Shannon McIntosh was born in Ohio and has been racing since the age of five. She won a variety of races in junior series before competing in the F2000 National Championship and The Road to Indy event. She made her debut in the ARCA Racing series in 2014 and is currently employed as a part-time driver for Cunningham Motorsports in that championship. Arguably the most successful female driver in the history of motorsport, Danica Patrick has won a race in IndyCar, placed on the podium in third place at the Indianapolis 500 and achieved pole position in the Sprint Cup. The 33-year-old is now racing in the NASCAR Sprint Cup series with the Stewart-Haas Racing team where she has finished in the top 10 six times.